Tired of spending a ton of time hand modelling your next project? 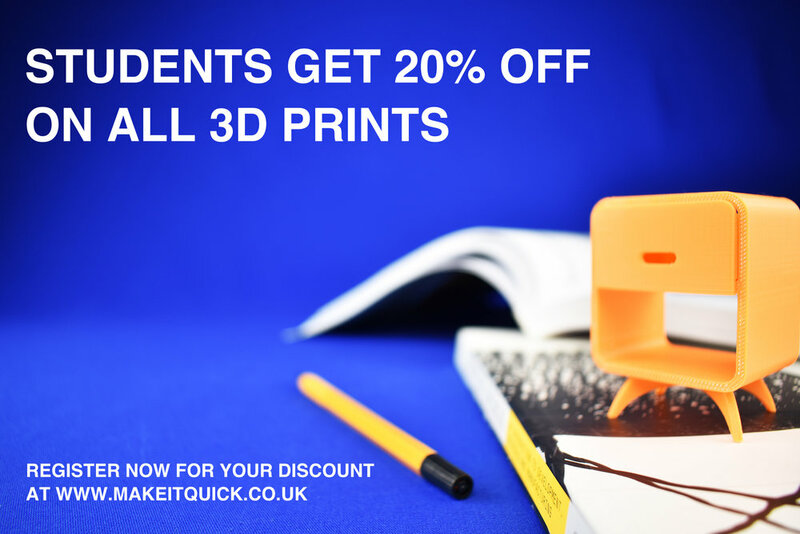 Here at Makeitquick we’ve got you covered with a 20% DISCOUNT on all 3d prints just to make your life a little bit easier. Registering for a student discount is as easy as ABC, just follow these steps and give a boost to your project now!! Simply visit our contact page on https://www.makeitquick.co.uk/contact and fill in the form with your educational email. As soon as we receive your message we’ll activate the 20% OFF discount on every order you’ll submit from now on. Upload your file on https://www.makeitquick.co.uk/ and simply choose the best material and finish for your project, follow our on-line guidelines and complete your order in a matter of minutes. That’s right, all orders are delivered for free in the UK, with production times as low as 1 day your model will be with you in a giffy. Getting your projects 3d printed has never been so easy, what are you waiting for? Let’s get started on https://www.makeitquick.co.uk/contact.